You are here: Home / News & Resources / News / Give the Doctors and Nurses Some Room! Give the Doctors and Nurses Some Room! Our major fundraiser will create a more open space for surgery with considerable benefits. An eye surgery operating theatre can get crowded. The surgeon, the anaesthetist, theatre nurses, and of course the patient, are all in there. Throw in an intern or resident learning vital new skills, and a support person for the patient… that’s a fair number of bodies and twice as many elbows. What if the surgeon had more room? What if there were more opportunities for trainees and visiting experts to watch the operation in progress, in intricate detail, without being in the way? Right now, Sydney Eye Hospital Foundation is raising funds to give an operating theatre a makeover that will take much of the equipment off the floor and suspend it from the ceiling. A collection of state-of-the-art technologies will enable our skilled surgeons to work more efficiently and less invasively. 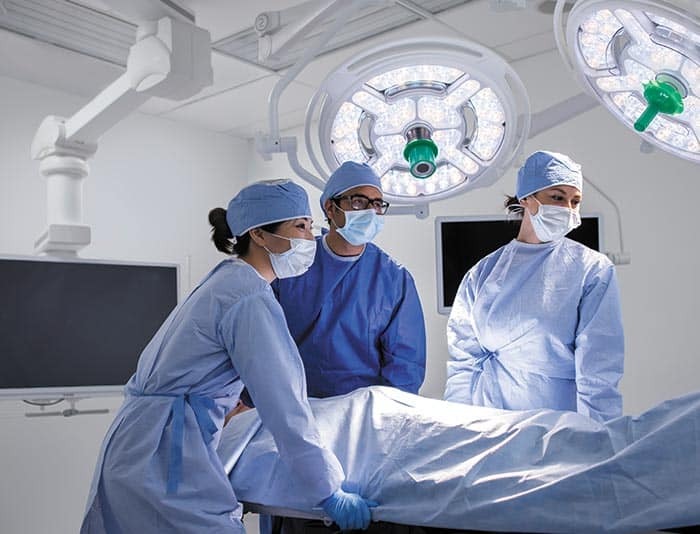 Crystal-clear 4K screens will reveal the surgery area under brilliant new lights. The result? More efficient and effective surgeries, saving time and improving training. a StealthStation navigation device, an imaging array that lets the surgeon accurately target the treatment area, through non-invasive 3D visualisations. The technology will also be a great teaching aid, training the next generation of surgeons. The whole team can watch. New equipment and more space will make a real difference in the theatre. The high initial cost of the StealthStation will be covered by the foundation. After that software upgrades can be easily afforded by the hospital’s own budget. “Everybody is very excited, and grateful for the Foundation’s support,” says Ross. The new theatre will especially suit oculoplastic surgery – from traumatic injuries, to unresponsive eyelids, to defects around the eye in newborn children. We started fundraising for this just before Christmas. suspended from the ceiling. Paint a few stars on a blue background and patients will think they’re in space. I view all this with great wonderment, marvelling at the great strides modern technology is continually making. So many people will benefit from this, and the associated devices mentioned in your letter. What next? I’ll watch this space as eagerly as Neil Armstrong watched his. Best wishes for your continued good work. Help us today to make the new operating theatre a reality. A donation for this new theatre will make a serious difference where it counts, on the ground, in the surgery, for every patient, and take some of the mental load off the doctors as well. Sydney Eye Hospital Foundation Ltd is a Charitable Fund and is endorsed as a Deductible Gift Recipient, with Income Tax Exemption & GST Concession.